There are 2 types of magnetic fields; Earth’s natural magnetic fields and then there are the artificial electromagnetic fields that are harmful to the human body. The Earth’s magnetic fields is composed of the static global geomagnetic field and there is also the “Schumann” electromagnetic field resonances (vibrations) (primary resonant frequency of 7.83 hertz). Our human bodies have evolved to function in alignment with the earth’s natural magnetic fields. The human body is essentially electrical and has bio-magnetic fields which are extremely small intensity on their own. The human bio-magnetic field is created at the cellular level and also has a core component in the Schumann Resonant range. As well the human bio-field has thermal infrared radiation emission. The artificial electromagnetic fields are produced by every electronic device and produce the damaging high frequency EMF’s causing our human cellular structure damage. As well there are the lower frequency EMF’s which are 50-60 hertz, and are at harmful levels near such things as power transmission lines. These artificial electromagnetic fields cause cellular damage, DNA damage and cause the cells to degenerate and malfunction. Shieldite has the unique properties of buffering the effects of the damaging EMF’s on the human cells. As our human bodies are designed to align with the earth’s natural magnetic fields what Shieldite does is transmute the electromagnetic fields created by electronics, impacting within our bodies, to the same frequency as the earth’s magnetic field rending them harmless. It will not stop the external EMFs rendering your electronics useless but just changes the frequency of their electromagnetic field to a compatible wave length within our bodies. Similarly in nature, properties of such elements as minerals and crystals are found to have certain properties such as magnetite having “magnetic” properties. Nature is the creator of such properties. For the key elements in Shieldite there is new information showing that there are properties of magnetic shielding that are being considered to protect even nano electronics from harmful external EMF’s. Our human cells are nano bio-electrical devices and with all the harmful EMF’s present today we also need protection. Our Human bodies are also crystalline in nature and this structure is also negatively affected by the harmful EMF’s. For example at the pineal gland of the human brain, bio-mineralization exists in the form of calcite micro crystals. These bio crystals are affected by the external harmful EMF’s via the piezoelectric effect. This un-natural external electromagnetic (EMF) excitation can cause a myriad of problems for our physiology with many mood disorders (depression, aggression, fear, terror etc. ), sleep disorders (melatonin production affected) and overall sensory perception distorted. The harmful EMF’s affect our very brain function. The Shieldite composition and properties “transmute” the harmful (negative) EMF’s and also part of the process take the negative energy (negative charge) of the EMF (electromagnetic field) and direct it safely to ground (earth) when the Shieldite is permanently grounded. Shieldite is recommended to be permanently grounded for the larger pieces of Shieldite when using in the home or office and in heavy EMF environments such as around computers, wireless devices, smart meters etc.. When Shieldite is worn or carried, the smaller pieces of the Shieldite will effectively fill up with the negative EMF energies as part of the process of transmuting the harmful EMF’s .These pieces of Shieldite must be “grounded” (earthed and cleansed) daily. The Shieldite internal structure does fill up and would stop working so it is important to ground your Shieldite frequently. Our Human body has it’s own bio-field which can be negatively affected by harmful EMF’s but it can be positively supported with beneficial frequencies. Our human bodies have been entrained with earths natural fields and with Shieldite we use our “Biometric Frequency Infusion Technology” (BFIT) which infuses subtle beneficial frequencies. The BFIT process supports the human Biofield and strengthens the Shieldite to contain the negative EMF energy before it totally is discharged to earth. There is a synergistic effect with the Shieldite natural properties and the BFIT. The Earth can be viewed as an individual planetary “cell” in the universe. 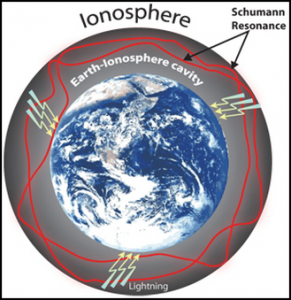 The Earth has an atmosphere with the upper region being the Ionosphere (simplified). It is known that the “body” of the earth is negatively charged (negative ions are the good ones). We humans live in the lower troposphere region. We have the cosmic rays from the universe emanating on the earth, which are essentially a constant source of energy. It is also known that the cosmic rays produce the ionization in the atmosphere. An important earth “cellular” global effect is the “Schumann Resonances” (discovered by the physicist Otto Schumann 1952). These resonances are generated and excited by lightning discharges within the cavity formed by the Earth’s surface and the ionosphere. The Schumann Resonances (global electromagnetic resonances) are a very subtle but core living necessity for human’s. The Schumann resonances are the result of this universal energy impacting on the Earth’s cellular structure and all the interconnecting resulting phenomena. It was found by Dr. Valerie Hunt experimentation that humans could not do without these earth’s natural magnetic fields. Nicola Tesla’s method (Nikola Tesla, U.S. Patent #512,340) proposed to harness the ‘free” cosmic energy was essentially to capture this inherent ionic energy within our atmosphere. This could be referred to as “Zero Point Energy”. Our own human cellular structure works on “ionic transfer” and the very subtle Schumann resonances support the ionic transfer within the cells. Essentially a key driver in our human cellular structure is from essentially the “Zero Point Energy” source. Electronic devices such as computers that create harmful EMF’s also create positive ions in our indoor working environments. The “positive ions” though have a negative effect on our physiology. Positive ions can create free radicals in the body which can cause damage to healthy cells and this increases the acidity of the blood. Many illnesses can occur. The balance of the autonomic nervous system is thrown off. Blood circulation is affected and the lymph circulation goes down causing a de-generative effect in our bodies. Shieldite is a very unique matrix of earth elements, one of them being fullerenes. This matrix is a “super receptor” of the natural “Zero Point Energies” and the resultant resonances as the Schumann resonances (very subtle energy form). The Shieldite uses the natural “Zero Point Energies” to create the transmutation process of the harmful EMF’s but also supports the communication of the beneficial natural earth’s magnetic resonances. The Shieldite is the element between the source natural “Zero Point Energy” and the human own cellular structure which also inherently is driven by “Zero Point Energy” patterns or resultant natural resonances. It is known that the earth is negatively charged (negative ions are the good ones). When Shieldite is continuously grounded to earth then the highly conductive property of Shieldite will also continuously cleanse and balance the surrounding positive ions in air (where these electronic devices are creating the positive ions). This ionic transfer through the Shieldite also has a beneficial energy transfer at a subtle level. The Shieldite transmutation and cleansing effect is what we refer to as the “Shieldite Effect”. The human body cellular structure “works” on a very delicate ionic transfer basis but also the whole earth works on this subtle basis. At Iyashi Source we have studied the Shieldite and BFIT phenomena and have confirmed these results of EMF protection through the positive effects on many individuals. We have measured the positive effects through naturopathic kinesiology techniques, and dowsing techniques utilized by ‘energy” healers. Does Shieldite® Work For Everyone? We have found Shieldite works for the vast majority of the population. The only people who were not compatible with Shieldite were individuals that had “reverse polarity”. Shieldite is compatible and works for everyone else. People who are sensitive to EMFs will notice an immediate difference while others will notice their EMF symptoms reduce over time although may not feel anything directly. Remember Shieldite works in a way similar to removing the surrounding electromagnetic radiation. Unless you are already sensitive to EMFs not everyone will notice the difference between an EMF filled environment and an environment void of EMFs like Shieldite creates. Type 1 ( most effective ) Transmuting – Shieldite transmutes the EMFs to a harmless state so they cannot damage your body in the first place. This is by far the most effective method as it stops EMFs from negatively affecting you in the first place. It operates much like a frequency converters for electronics that step up or down the levels. Type 3 – Strengthening the Human Biofield – Natural crystals or products infused with BFIT have frequencies which strengthen and align the bodies energetic fields. This helps the body naturally heal itself. Again the damage has already occurred in your body and this only focuses on improving the body’s natural healing response. The BFIT enhances the properties of Shieldite. Type 4 – Grounding – Shieldite takes the negative energy from harmful EMF’s and discharges it to ground (earth). It is important to understand as you do need to ground your Shieldite! If you are walking barefoot on the grass/dirt and wearing the Shieldite then both you and the Shieldite will be grounded and cleansed. Shieldite is recommended to be continuously grounded or for smaller pieces that are worn on the body they must be grounded daily. Negative Ions – help body functions and repair damage. Some alternative products use battery or wall outlet powered devices which claim to produce a “harmonizing” type of frequency transmitted from these human made devices. 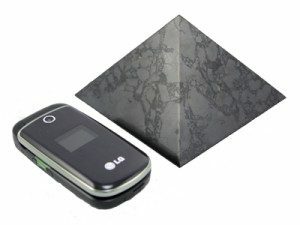 Effectively these devices are just another type of EMF producing device at whatever frequency these devices transmit. It is impossible for these devices to mitigate or alter any bad EMF such as from cell phone towers. By the simple laws of physics of electronically generated frequencies: BAD EMF + Other generated human made EMF = still equals BAD EMF doing the damage. These human made devices don’t transmute anything but just add some other signal. This other signal is sometimes claimed to be the Schumann– Resonance and scalar field. First this simple type of electronic human generated signal is NOT Scalar Field and is in the simple realm of simple frequencies. Schumann-resonance is a natural phenomena of the magnetic fields generated from lightning discharges in the earths atmosphere and transmitting in the channel between the ionosphere and the earths surface. These simple human made devices do not even closely resemble anything of the Schumann Resonance. PEMF (if the proper design) is known to provide health benefits for human cellular regeneration. Although this can be beneficial, PEMF will not eliminate or otherwise affect the BAD EMF’s that are present. You still need to mitigate the Bad EMF’s as what is done with Shieldite. PEMF therapy is also another product which is also offered by us at “Iyashi Source” (see www.healthywavemat.com). We recommend our product for the cellular regeneration process. We do not advise the use of PEMF for the elimination or mitigation of Bad EMF’s. Other manufacturers make this claim but it doesn’t work to eliminate or mitigate harmful EMF’s. Crystal Therapy has a very broad metaphysical range of applications for good health benefits. We at “Iyashi Source” do use certain crystals for various applications. We have found that certain crystals do assist in strengthening the Bio-Field . We have found that Shieldite is the most powerful EMF protection device that actually transmutes the Bad EMF’s. So assisting with other Crystals is a good thing but not a full solution to Bad EMF’s. Crystal Therapy may strengthen the Bio-Field but this effect does not effectively mitigate or eliminate harmful EMF effects. The analogy here is that if a boat has a major water leak, you need to repair the water leak; just using a pump to pump water out of the boat doesn’t solve the water leak problem. It is possible to directly shield from Bad EMF’s effectively using the “Faraday Cage” method. There are some fabric materials which can provide Shielding to high frequency damaging EMF’s. The problem with this method is that you cannot practically shield yourself in a fully encased shield material and go about your business during the day. Your head and brain (as well as many parts of the body) would typically be exposed under most conditions. Then there is the problem of various fake suppliers supplying some black looking rocks and claiming to be the same as Shieldite. This is the “after market” effect of fake suppliers providing fake and ineffective products. There is lots of cheap mining waste products which the fake suppliers are using. After Iyashi Source had started to supply Shieldite we have been finding various “knock-off’s” and other fake suppliers copying statements etc. Shieldite is very closely controlled and guarded and the fake suppliers cannot provide anything to even closely match Shieldite. IIT Health/Iyashi Source is the exclusive supplier of Shieldite. If it is not sold under IIT Health, Iyashi Source, or one of our approved distributors it is not Shieldite. Do Grounding Tests Show You Are Protected From EMFs? There are some videos and grounding products that use a volt meter to show when using their grounding mat the reading drops to zero implying you are protected from EMFs. This is done by sticking one of the prongs in the ground plug and then holding the other, which will give you a reading of up to a few volts. When you touch the grounding mat your voltage drops down to 0. Remember your body conducts electricity and what the meter is measuring is the difference in voltage between the ground plug ( 0 volts ) and you ( up to a few volts ). When you touch the ground, the meter is now using you as a conductor between the ground plug at ( 0 volts ) and the grounding mat ( 0 volts ) which is also plugged into the ground plug, the difference is obviously 0 and that is why the reading drops. Your bodies voltage has not dropped but simply rather than testing your voltage will bypass you and use your skin to act a conductor between the 2 ground sources. Basically this does not mean you are protected from EMFs nor does it drop your body voltage. Our bodies are naturally electrical and our cellular structure will continue with the ionic transfer and generate the subtle internal magnetic field. Some people try to prove that their “EMF Protector” material/device works because a Gauss Meter reading drops when their supposed EMF Protection material is placed in between the meter and the Microwave oven which is generating EMFs. This method is simply a false reading because the person is holding the small piece of material when they place it between the microwave and the meter. The human body (hand touching) distorts the reading and the reading is false. When using gauss meters to measure EMF’s you need to make sure you are not affecting the readings by interfering with your body. Your body is grounding the EMF signal in these false testing videos. Copyright © 2018 Innovating Ionizing Technologies Inc.. All Rights Reserved.